Last night I opened up Google Reader, my sorely neglected portal to the rest of the blogosphere. I currently subscribe to 490 blogs, separated into folders for my sanity. These folders range from Food to News to DC Neighborhoods to Interior Design to Transit Planning. Oh, and then there's "Personal," and that's the folder where you probably reside, if you're reading this and have a blog of your own. My overall Reader count will pop up over 1,000 posts in a single day if I don't open it (I've always viewed Reader's policy to stop counting over 1,000 to be kind), but I normally have certain folders under control. Normally. Only, here's how bad it's gotten: my "Personal" folder, your folder, had 716 unread blog posts in it as of last night. 716. So if you're wondering why I haven't commented or chimed in on your stories, both big and small, that's why. I'll get there. I cooked this weekend! This is a big deal... my kitchen has been used mostly just for coffee and eggs all month long. But behold, fish tagine and lemon curd tart! It's awesome having a National League team to root for now. And the stadium a 25-minute walk from my house? Bring. It. On. I accidentally got sucked into The Voice. Embarrassing. Aaaaaaand.... that's about it. My life is so crazy, right? I would ask what's new with you, but I suppose to find that out all I need to do is wade through that Personal Blog folder, don't I? That said... are Cee-Lo Green's arms really that short? He's like the world's funkiest T-Rex! @Meister: His hands are shockingly tiny, too. Work, work, work, work, buy clothes, hang with significant other, talk to kids. There. Now you don't have to read my blog:). Wait! I KNEW I would forget someone! I wrote about meeting bloggers and I didn't include you! Must rectify! Ummm I am going to need the fish tagine recipe. It looks insanely delicious! 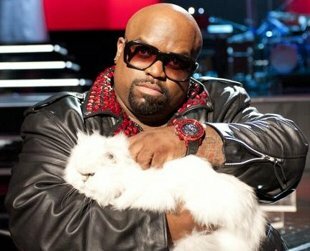 That picture with Cee-Lo's scary hands on that poor cat freaks me out. Poor cat. I never realized that I got categorize my reader into folders. You seriously just made my day. And clearly I can't type either - I got?!?! Must be the excitement of organization!